Senior Moments Weimaraner Rescue needs Temporary/Emergency, Short- and Long-term foster families for homeless Weims age 10 years and above. If you have room in your heart and home to help a senior Weim in need, we’d love to hear from you! For the safety of your children and the welfare our dogs, SMW does not adopt to nor have foster homes with children under the age of 10. For the welfare of our dogs, all dogs and cats in the foster home must be spayed/neutered, up-to-date on veterinary care and dogs must be on a form of heartworm and flea/tick prevention (alternative/natural methods are encouraged but not required). Senior Moments will cover the cost of pre-approved veterinary care and supplements/mobility aids, etc. as needed. If possible, we ask that the foster families provide high-quality food for their foster dog as a donation to the rescue. Expenses for foster dogs are generally tax deductible, check with your preparer to be sure. Our application is below. Every question helps us get to know you better and gives our Weims the best chance at a successful stay with you. Answers to all questions are required for application processing. Thank you for helping us help the seniors! If yes, are roommates in agreement to foster a Weimaraner? Who will be the primary caretaker of the foster Weimaraner? Have all members of the household agreed to foster a Weimaraner? I am aware that a foster dog may need veterinary care (may need to be spayed/neutered, brought up-to-date on titer tests/vaccines and other minor medical issues). I am aware that Senior Moments Weimaraners will pay for an AUTHORIZED vet care and I agree to be responsible for making appointments, notifying SMW of them, taking the Weim to them and following aftercare instructions. I am aware that Senior Moments Weimaraners takes a holistic approach to veterinary care and, where legally possible, will have titer testing done to determine the protective level of Distemper and Parvo antibodies before automatically vaccinating. Most senior dogs have had multiple vaccines over their lifetime and over-vaccination has proven health risks. Rabies vaccines will be given without titer testing. I am aware that flea/tick prevention will be accomplished using natural methods provided by SMW whenever possible rather than pesticide application on the Weim (exceptions initially made for dog with existing pests). I am aware that my foster dog may require basic obedience training/manners, housebreaking and/or crate training and I am willing to use positive methods suggested by SMW to help prepare my foster dog for a permanent home. I agree to alert SMW as soon as I notice concerning behavioral issues. I am aware that the period of adjustment into my household may be longer than anticipated for a foster dog. I am aware that SMW may have little to no information regarding the background of my foster dog, but whatever they know will be passed along to me. How many hours during a typical day will the dog be left alone (without humans around)? How often will the dog be left alone (daily, weekdays, ___ days per week, etc.)? Do you understand that your foster Weimaraner is to be an indoor dog only? Where will your foster dog stay when you are not home? Where will your foster dog be at night? Weimaraners are a very demanding breed and require a great deal of time and attention. With your schedule and commitments, explain why you think your home would be suitable for fostering a senior Weimaraner and how you plan to assimilate him/her into your family. Thank you so much for taking the time to apply! One of our volunteers will get back with you within 72 hours. "How many times have you actually been able to save a life? There's nothing like it and it's what fostering is all about. Fostering a senior Weim is truly the difference between life and death for that dog. I've been a foster parent to over 30 dogs of all ages and sizes. Seniors are my favorite. An old soul is a joy I can't describe but one I wish everyone could experience. Seniors soak up every ounce of love you have to give with grateful hearts. Fostering allows you to meet and love dogs you may not have had the chance to know and provide them with love, comfort and hope. We became involved with SMW through a friend and it has been a wonderful experience. You couldn't ask for a more professional and caring group of people. Our current foster dog, well, there aren't enough words to describe how much love we have for him. I can't even walk by him without kissing him or giving him a hug. He makes me smile everytime I look at him and he has the most grateful heart. He came into our pack with no agenda and fit in like a dream. Our whole family is quite smitten with him. Fostering provides a joy that words can't convey and we would do it 100 times or more." "I have had a wonderful experience fostering for SMW. They are very supportive during the fostering process, easily available to answer any questions and offer support. Fostering is so rewarding! It was very heartwarming to welcome our foster into our home. Our foster boy became Weim #3 in our pack and has been a welcomed member of the family. He brought much joy into our home." "We both grew up with dogs and cannot imagine our life without them. Fostering was a natural progression after being asked to take in a dog for a 6-month stint. We each have a soft spot for dogs and there are many out there that need anything from a ride to a couple days to a couple months. In our history we’ve taken in at least 40-50 dogs over the years, some easy and some not. What you find is that a rescue dog knows that you are there to help. Even the most shell-shocked dog will eventually come out when in a loving environment. All that is required is love, patience and a little dog-sense. The real pay-off is knowing that you are providing possibly the best home a dog has ever known and you are giving them a pathway to a safe and brighter future. The first question that is always asked is how will you be able to give them up? If you have your own dogs, you remember that this one is a guest and will eventually move on. Occasionally there is one that comes along at the right time, with the right circumstances and you know you are meant to be the adoptive home. The dogs that are meant to be with you, will choose you. For the others, you are a supportive stop along the way to their forever home. It is so rewarding to learn a dog’s personality and enjoy those moments when pure joy passes over their face for the first time. Go ahead and foster – good and bad, happy and sad, you will learn through rescue that you are getting more out of the experience than you ever thought possible." "Fostering for Senior Moments Weimaraner Rescue has been amazing. I'm a long-distance foster mom, but they are always there for support if I need it no matter what is. When I was first deciding to foster a Weim, I was so concerned about taking in another dog while living alone with my two high-energy crazy Weim girls already. My first Weimaraner, Steeler, passed away at 6 1/2 and I was robbed of her senior years. I felt that in her memory I had to at least try fostering because so many dogs need saving and foster homes to go to. I took in a Weim boy from SMW and learned that here is nothing more rewarding than fostering but a senior. They are very special and have outgrown all (well, most!) of the antics and energy of a younger Weim. They are so grateful for anything and everything – but especially for love, snuggles, food and a warm, comfy couch or bed until they find their forever families. If you have ever considered fostering there is no better way to start than with a senior. I think its truly amazing that a rescue takes in the older dogs and gives them everything they need till they get adopted. If that can't happen, SMW supports the foster family who provides love and hospice care for whatever time they may have left. There is nothing more rewarding than being a part of saving a precious life, and that precious life rewarding you with love for being rescued." 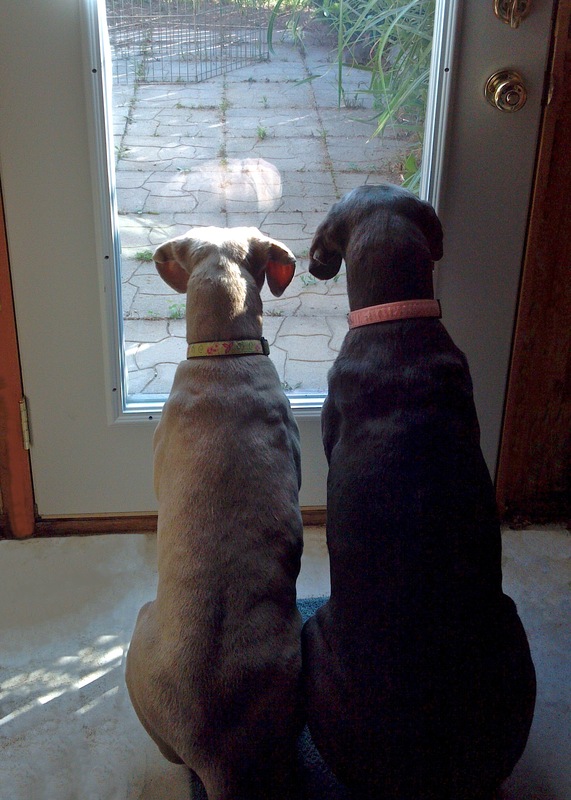 "The experience I had fostering for Senior Moments Weims was amazing! It all began when it was nearing the time to say goodbye to my own 14-year-old Weim baby, Suede. I messaged them for comfort and support and the response from SMW followers on Facebook was incredible. It helped so much to hear their words of understanding and support. Shortly after Suede passed, I learned that SMW had a 10-year-old boy with a very sad history who needed a comfy, loving place to hang out. After talking to Cheryl and Laurie at SMW, I eagerly agreed to foster Hobo. This was the best decision I could have made! Hobo had such a sweet soul and was a complete joy to have in our home. It was the most amazing thing to watch this beautiful boy open up and become a true Weim. Laurie's number was saved in my phone, and I used it often as this was my first time ever fostering and it was like having your first baby! There was always a calm answer to my sometimes silly questions. If I had a question that needed looking into, I heard back very quickly. SMW made fostering so easy! I just had to give Hobo a place to hang out, everything else like food, meds, vet visits and other expenses were covered by SMW. We provided love and attention to a sweet dog. Fostering for SMW has been an amazing experience! I'm also on the Joyride Team, another way I can help by driving these senior babies to their new lives." "I asked SMW to bring my first foster dog, Annabelle, to my home so that my dog wouldn't think that I was bringing in "competition" for her. Both dogs hit it off immediately, and there was no problem bringing Annabelle into my home. Annabelle was the sweetest girl ever and I fell in love with her immediately! I was warned that she had incontinence problems, which I never experienced in the month I had her. She did have a torn ACL and she was overweight. SMW was great about giving me information and medicines to help her with those two problems. I can't say enough about what a loving, wonderful dog she was! I honestly felt like I might want to keep her, but I knew there was a wonderful home waiting out there for her, and there was!!! I don't want to make it seem like it were no adjustments I had to make. I had to move my dog's dish to a spot where only she could get to, because she is a "grazer" and I knew Annabelle would eat both her food and Molly's!! At night, Annabelle was left to sleep in her bed while Molly and I went to my bed. I wanted Molly to feel that this was her space as it always had been to keep Molly from being jealous. It worked very well. The joy of seeing Annabelle leave with her new "dad" brought tears to my eyes because I was so happy for her. The feeling of helping a senior dog find a new life is one of the best I've ever had. I recommend this journey to anyone who has a love of this wonderful breed of dog!" "I have not been a foster mom for very long. However, I have been a mom of the breed for many years. After losing my two Weims unexpectedly, I was heartbroken. Fostering Weimys for SMW has helped with my broken heart and I'm not so lonesome. SMW is a phenomenal group of people. The volunteers' hard work, love and devotion toward senior Weims is amazing. These few volunteers devote their lives to saving these poor senior dogs in need. I am happy to be part of their team."